While much of the maze of old structures, basements, and temple substructures in the undercity is technically the domain of “cults” of the various gods of order and change, there are some areas that are either ignored and in ruins… or in this case have been taken over by a small cult of one of the Pariah Gods. 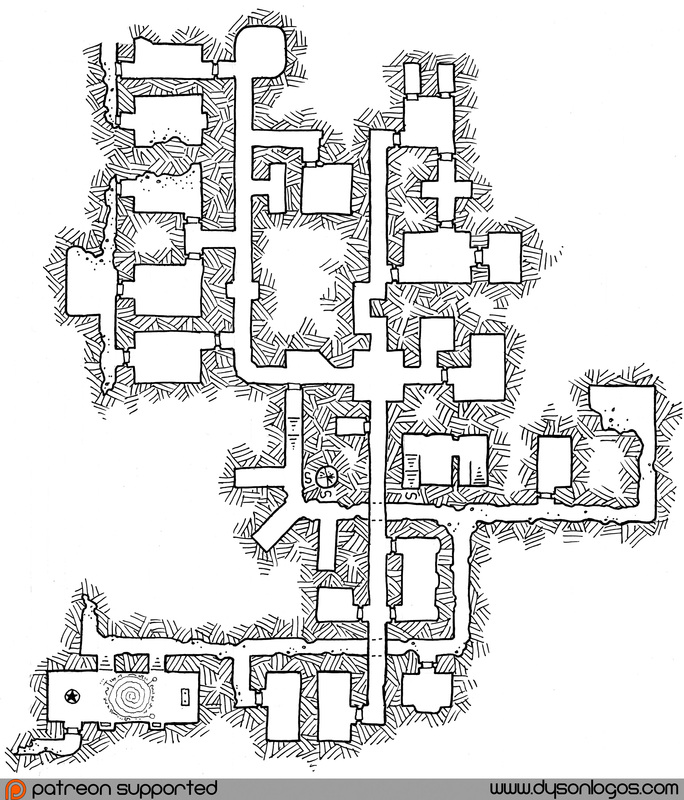 Nestled beneath the streets of the fine city, the Pariah Gods cult’s ritual space is at the lower left here, and they access the area via a secret door from a building basement in the central portion of the map that then leads almost directly to their worship space without crossing into areas of the undercity controlled by the approved temples. More disturbing to someone who ends up investigating this Pariah cult is the secret stairs nearby. They lead up to a long-sealed hatch into a clanhouse, but also lead much deeper into the undercity – to areas sealed off and thought destroyed by ditlana who knows how many hundreds of years ago. The small Pariah cult operating here now has roots in a much older and larger cult. This map section only connects to map 1P via the old crumbling ruins and passages to the north. Surface access is via the basement the pariah god cult uses to get to the lower sections of this map, and the secret spiral staircase near the basement access leads even further down into the undercity. How big are you planning to let this get? There seem to be lots of open ends around, but not enough space on the current overview to fit more maps. There aren’t that many open ends left, and the overview has always grown to fit the maps as they are added. I expect another 3-6 maps for level 1. I know that city maps aren’t your thing/ but do you have a thumb nail sachet here your working from?